Spinballs, from independent developer Christian Gross, is a colorful puzzle game for the iPhone and iPad. 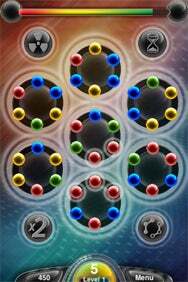 The time-sensitive “match-three” variant tasks the player with rotating discs filled with colorful orbs so that same-colored orbs connect. While Spinballs gets repetitive fast, for a short time filler it’s not bad. There's color and the ability to rotate the discs and well, not much else. Some explosions might be nice. When you start Spinballs, you’ll see seven big discs arranged in a hexagon pattern. On each big disc, there are six smaller colored orbs. Colors include yellow, green, blue, and red. With a clock winding down, your objective is to spin the big disc together in way that will make the smaller orbs of a particular color line up. For example, you'll want to line up the blue orbs with each other, etc. If you get enough colored orbs lined up, you press a button at the bottom of your screen to make the matched orbs disappear and earn points. LIke other "match three" variants, new colored orbs will then appear to take the place of the previously matched orbs. Scoring points makes the game’s clock increase its time. If the clock reaches its limit, you have to start an entire game over again. However, if you score enough points, you move onto another level where orb matching becomes harder. The game was a worthy challenge for a few tries, but after I got the hang of the gameplay it was easy to pass on to the next level. Like the game itself, Spinballs’ add-ons are sparse. The game has no mini-games, no iTunes connect abilities, and no multiplayer options. The menu consist of a game start button, a tutorial, a high score button and a settings button. The settings button takes you to the game’s music and sound controls. In the next addition of the game, it would be nice to have a little more content. I was engrossed in with matching orbs for about twenty minutes. After that time, I quickly stopped wanting to play. Due to its limited content and lack of replayability, Spinballs is a great game for a short bus ride home, but not much else.